Nick Rowe likes to remind us that money is the only asset on every market. If the supply of or demand for this one asset is disrupted then every market will be affected. This reasoning implies that monetary disequilibrium is essential for the emergence of general gluts. This crisis has reinforced this understanding, but also has shed some new light on what it means. Specifically, this crisis has shown that what is used as money is far broader than the standard measures of money. The widely used M2, for example, is limited to retail money assets like cash and deposits accounts that are used by households and small businesses. Institutional investors also need assets that facilitate transactions, but the assets in M2 are inadequate for them given the size and scope of their transactions. Consequently, institutional investors have found ways to make assets like treasuries, commercial paper, repos, GSEs and other safe assets serve as their money. These institutional money assets, therefore, should also be considered part of the money supply. 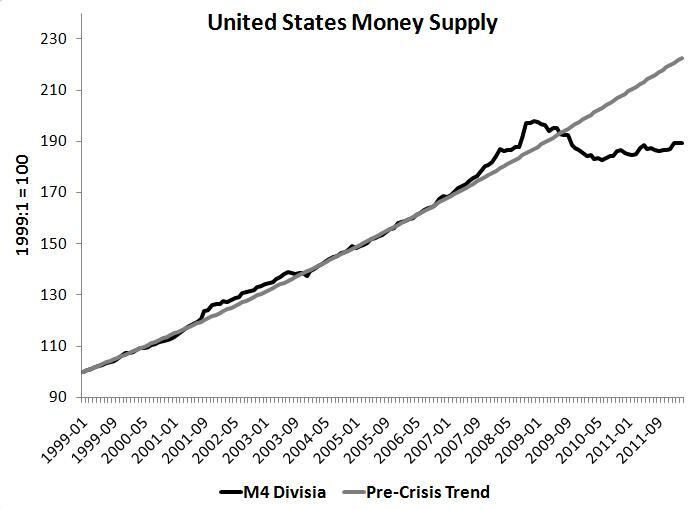 When viewed from this broader perspective, the money supply has been depressed during the crisis in both the United States and the Eurozone. It should be no surprise then that both regions are in slumps. No surprise here. Germany's economy is doing relatively well and thus we would expect to see better monetary conditions there. This relative stability of the money stock is another reason why Germany is no rush to open the ECB monetary spigot to save the Eurozone. Why disrupt stable monetary conditions in Germany? So what are the monetary policy implications? The most obvious one is that the Fed and ECB should create an environment conducive to monetary asset creation that would support the return of robust aggregate nominal spending. Since most of the money assets are created by the credit, maturity, and liquidity transformation services of financial firms, policymakers should aim to create an environment conducive to increased financial intermediation. The easiest way for monetary policy to do this is to raise the expected growth path of aggregate nominal expenditures. This would raise expected nominal income growth and the demand for money assets. This, in turn, would catalyze financial intermediation and lead to the creation of more money assets. And of course, the way to raise the expected growth path of aggregate nominal expenditures is to adopt a nominal GDP level target. It is time for monetary regime change! Over the last twenty-five years, a set of influential studies has placed interest rates at the heart of analyses that interpret and evaluate monetary policies. In light of this work, the Federal Reserve’s recent policy of “quantitative easing,” with its goal of affecting the supply of liquid assets, appears as a radical break from standard practice. Superlative (Divisia) measures of money, however, often help in forecasting movements in key macroeconomic variables, and the statistical fit of a structural vector autoregression deteriorates significantly if such measures of money are excluded when identifying monetary policy shocks. These results cast doubt on the adequacy of conventional models that focus on interest rates alone. They also highlight that all monetary disturbances have an important “quantitative” component, which is captured by movements in a properly measured monetary aggregate. My interpretation is that when an economy is growing, it endogenously creates more broad money to finance its growing urge to spend. The money follows the expansionary drive. Isn't the most direct way to jack up both money and useful spending on production and consumption for the government to spend money directly into existence to buy goods and services? Yes,these broad monetary aggregates are endogenously determined. That is why I was careful to say the Fed should create an economic environment that would increase the demand for money assets. Financial firms would respond by creating more money assets. Where we differ is that I believe the Fed can create such an environment by better managing expectations. Compare the doubling times of the money supply in the first two graphs with that of the third , Germany. Germany didn't go on an unsustainable debt binge , so why should we be surprised by these graphs ? Even more to the point , why would we would to re-establish the very process that brought us to our knees ? “Since most of the money assets are created by the credit, maturity, and liquidity transformation services of financial firms, policymakers should aim to create an environment conducive to increased financial intermediation.” This looks like a non sequitur. Policymakers should be primarily concerned with the overall money supply, not with any particular components of it. Any deficiency in the money-creating efforts of private financial intermediators can be made up by extra creation of base money by the central bank. There are couple of problems with your conclusion. First, one cannot look at the supply of money by itself and conclude whether it grew too fast in the past. You would need to also look at the demand for it. The demand for money, in turn, can be different based on different circumstances (e.g. NGDP growth) in these countries. I agree the overall stock of money matters should be the focus. But most of it is made by private firms. Thus, in order to stabilize the stock of money private firms are going to have to play a big part of the process. And yes, the way the Fed can encourage that is the threat of permanently increasing, or increasing until some target is hit, the monetary base. "For every debtor there is creditor, thus if debtors cut back on spending to deleverage then creditors should be receiving more funds with which they could provide an offset in spending." OK , I'll pass on that one. I try to stay away from religious debates. I think if you looked at money supply growth rates , you'd find that all those countries that had a Ponzi-style ramp in credit , as we did in the U.S. , had rampant rates of money growth compared to countries that didn't have such credit booms. To suggest that all that the Ponzi countries had to do was to keep the Ponzi going is ludicrous in the extreme. There is nothing religious about the debtor-creditor relationship. Your comment here is disappointing. Engage the point instead of ignoring it. Read my link above as well and check out the one below. It goes into more detail about the debtor-creditor link. from where exactly did you get the data on German M3? 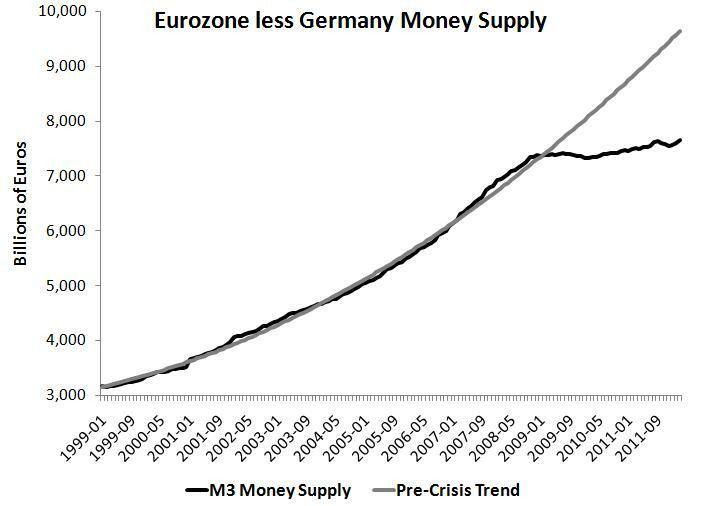 Is it possible to get data on money supply for euro area country? What ois so special about a dead and spider-webbed trend line from half a decade in the past. The trend in the here and now is up. Why not worry about "fitting" a trend from 85 years ago, or 150 years ago? This needs to be justified, argued for, explained, not asumed as a "given". I have another measure of money which is constructed by taking M1, adding sweeps (for the US after 1994) and subtracting savings. Since monthly savings figures (Personal Savings) for the US are available only since 1950, this measure of money is available only from 1960 onwards. It shows that the contraction in money began around January 2006. Its initial manifestation was the fall in housing starts. Only much later did it work its way to other parts of the economy, resulting in the crash of 2008. The graph also shows that we are headed for another crash, bigger than any before. "Germany didn't go on an unsustainable debt binge", Germany went on an unsustainable CREDIT binge. German banks were the most overleveraged at the beginning of the crisis, now they have passed most of their cross-border Eurozone exposure to the ECB. And yes, for every foolish over-leveraged creditor, there is an equally imprudent over-extednded creditor. There is no virgindebt by immaculate conception. When the credit bubble bursts, creditors can expect to suffer some of the losses. How about this as a change? Systematic restructuring of household debts to improve debt service capacity and also household free cashflow (offsetting the persistent real income declines of past 3-5y). Would help households normalise their demand and hence incentivise investment. Banks will take a hit to capital, addressed through bail-in of senior unsecured (which is what is coming post-2018 anyway). In fact, the bail-in needs will not be one-for-one with the writedowns on household debt, because the improved household debt service capacity will lower the household PDs in banks' risk models. I fully appreciate their is moral hazard here, but frankly we are past the point where issues like that should constrain policy, when radicalism is needed. 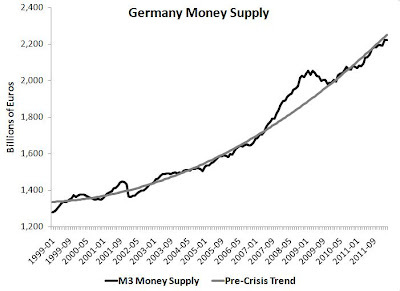 Look at the magnitude of the money supply growth in the US vs. Germany. 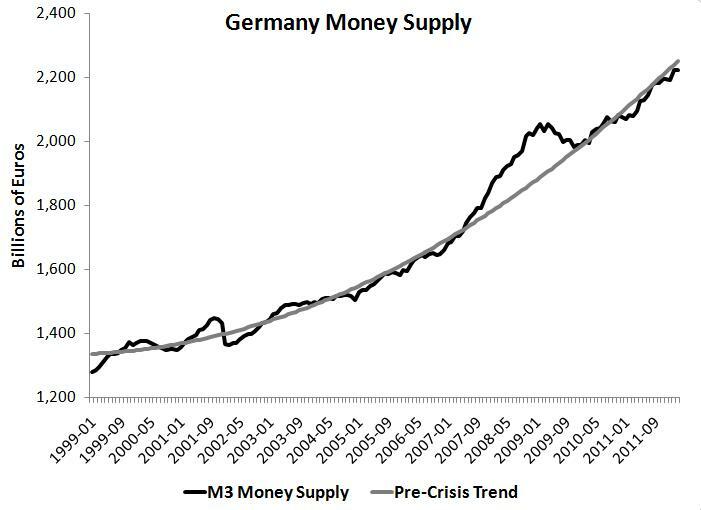 Just eyeballing the numbers, broad money growth from roughly 2000 to 2007 was DOUBLE in the US relative to Germany. The NGDP growth is probably similar. What you saw in the US was a lot of excess credit growth feeding bubbles. Now it is coming back to earth. I know these kind of comments are not fashionable in cutting edge monetary policy debates. But it is high time some of you start looking below the surface at what fuels bubbles. Germany probably had broad money and credit growth more in line with NGDP and did not suffer a crisis as big - leading to continuing growth there. In the US, we are in a deleveraging mode. Your graphs are just symptoms not causes. If they are causal, then my comment above has to be taken seriously. Why was credit growth in the US so much higher than NGDP growth and what role did this excess growth play in causing the bubble?